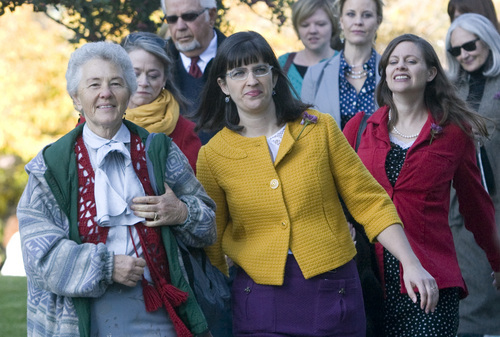 Feminist group plans to keep trying, though poll shows most LDS women don't want ordination. Rick Egan | The Salt Lake Tribune Debra Jensen (center) chats with Jeffrey Smith while trying to gain admittance to the Priesthood session of the 183rd Semi-annual General Conference, Saturday, October 5, 2013. Rick Egan | The Salt Lake Tribune One by one, members of the group Ordain Women, are turned away, as they attempted to stand in the standby line to try to gain admittance to the Priesthood session of the 183rd Semi-annual General Conference, Saturday, October 5, 2013. Rick Egan | The Salt Lake Tribune Chelsea Shields Strayer speaks to the group Ordain Women before their walk to LDS Conference Center to stand in the standby line to try to gain admittance to the Priesthood session of the 183rd Semi-annual General Conference, Saturday, October 5, 2013. Rick Egan | The Salt Lake Tribune Ruth Todd, LDS spokesperson, talks to the group Ordain Women, speaks to the group onTemple Square as they attempted to stand in the standby line to try to gain admittance to the Priesthood session of the 183rd Semi-annual General Conference, Saturday, October 5, 2013. Rick Egan | The Salt Lake Tribune Nadine Hansen (left) and Katie Kelly lead the group Ordain Women as they walk to LDS Conference Center to stand in the standby line to try to gain admittance to the Priesthood session of the 183rd Semi-annual General Conference, Saturday, October 5, 2013. Rick Egan | The Salt Lake Tribune Nadine Hansen (left) and Katie Kelly lead the group Ordain Women as they walk to LDS Conference Center to stand in the standby line to try to gain admittance to the Priesthood session of the 183rd Semi-annual General Conference, Saturday, October 5, 2013. 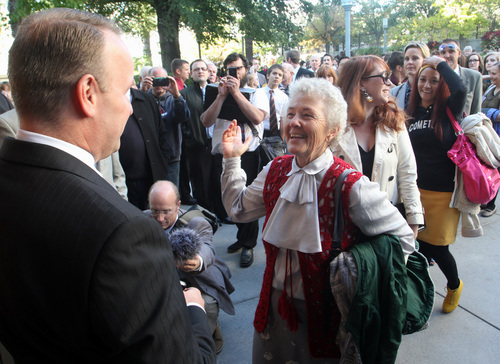 Rick Egan | The Salt Lake Tribune Doug Peterson refuses to let Nadine Hansen (right) into the standby line on the Tabernacle, as Hansen and the group, Ordain Women try to gain admittance to the Priesthood session of the 183rd Semi-annual General Conference, Saturday, October 5, 2013. 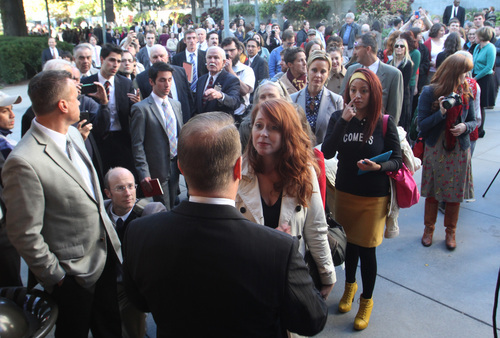 Rick Egan | The Salt Lake Tribune Doug Peterson refuses entrance to Chelsea Shields Strayer as she attempt s to get in the standby line to try to gain admittance to the Priesthood session of the 183rd Semi-annual General Conference, Saturday, October 5, 2013. 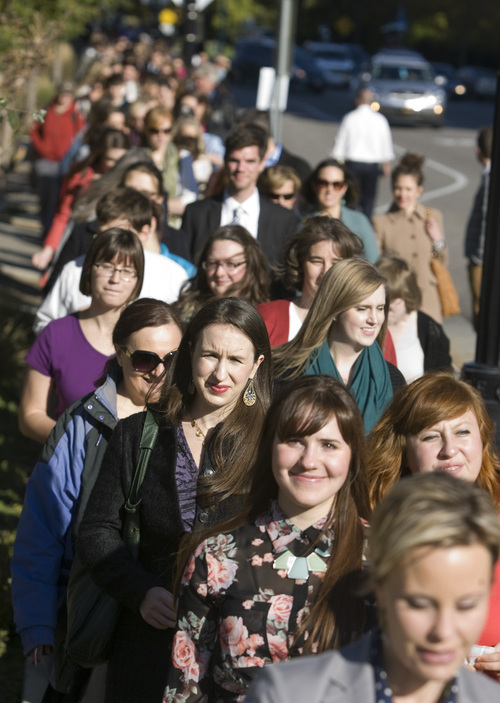 Rick Egan | The Salt Lake Tribune Members of the group Ordain Women walk to LDS Conference Center to stand in the standby line to try to gain admittance to the Priesthood session of the 183rd Semi-annual General Conference, Saturday, October 5, 2013. Rick Egan | The Salt Lake Tribune Doug Peterson refuses to let Nadine Hansen (right) into the standby line in the Tabernacle, as Hansen and the group, Ordain Women try to gain admittance to the Priesthood session of the 183rd Semi-annual General Conference, Saturday, October 5, 2013. 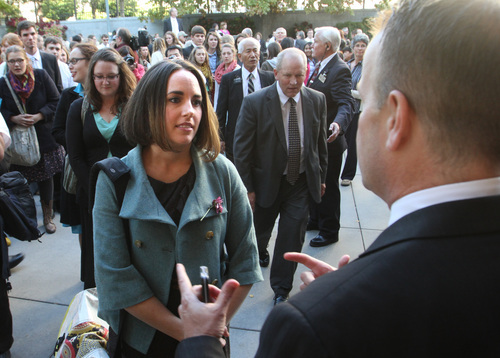 Rick Egan | The Salt Lake Tribune Katie Kelly, with the group Ordain Women, speaks to the group before their walk to Temple Square to stand in the standby line to try to gain admittance to the Priesthood session of the 183rd Semi-annual General Conference, Saturday, October 5, 2013. Rick Egan | The Salt Lake Tribune Ruth Todd, LDS spokesperson, talks to the group Ordain Women, speaks to the group onTemple Square as they attempted to stand in the standby line to try to gain admittance to the Priesthood session of the 183rd Semi-annual General Conference, Saturday, October 5, 2013. Rick Egan | The Salt Lake Tribune Doug Peterson refuses to let Kate Kelly (right) into the standby line in the Tabernacle, as Kelly and the group, Ordain Women try to gain admittance to the Priesthood session of the 183rd Semi-annual General Conference, Saturday, October 5, 2013. Rick Egan | The Salt Lake Tribune Nadine Hansen (left) and Katie Kelly (yellow) lead the group Ordain Women as they walk to LDS Conference Center to stand in the standby line to try to gain admittance to the Priesthood session of the 183rd Semi-annual General Conference, Saturday, October 5, 2013. 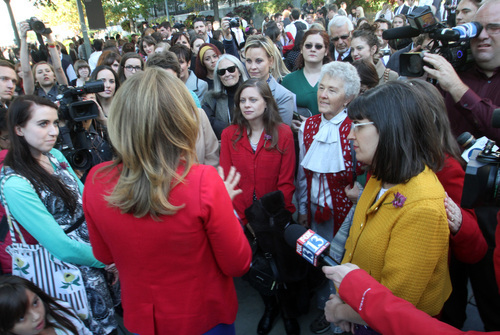 It was a powerful image, just as the Ordain Women group intended on Salt Lake City&apos;s Temple Square. 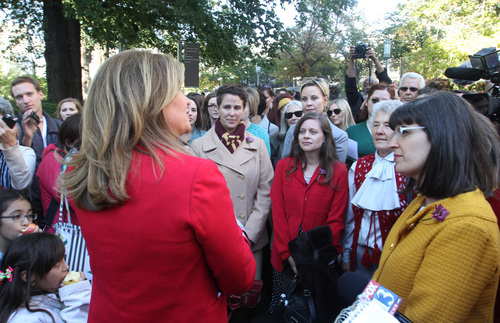 As 130 women stood outside the Tabernacle on Saturday afternoon, rejected in their bid to secure tickets for the all-male priesthood session in the nearby Conference Center, dozens of boys and men streamed inside to pick up last-minute tickets to the meeting. It felt, said Julia Murphy of Heidelberg, Germany, like "they are more important." 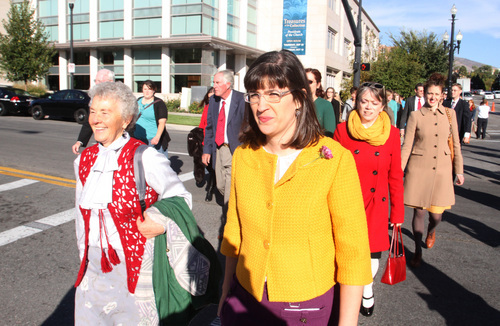 Murphy traveled from Europe to join other women  and a couple of dozen men  in the Ordain Women movement, which is pressing for the Utah-based Church of Jesus Christ of Latter-day Saints to extend the priesthood to women. Only worthy males 12 or older are ordained in the faith. 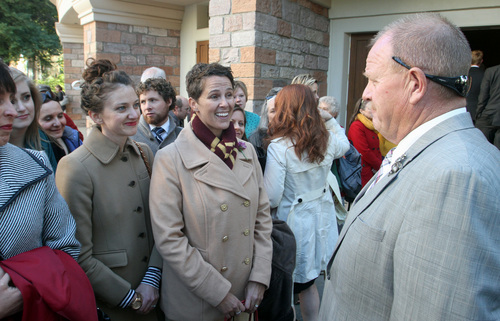 Kate Kelly, one of Ordain Women&apos;s founders, said the group appreciated the comments of Dieter F. Uchtdorf, second counselor in the governing First Presidency, earlier in the day, extending a welcome to those who have left the church or find some of its teachings difficult. "We are thankful there is room for us and we hoped there would be room in the priesthood meeting, too," said Kelly, an active Mormon and a human rights attorney in Washington, D.C. "As we have demonstrated, there are hundreds of women in the church who support ordination." 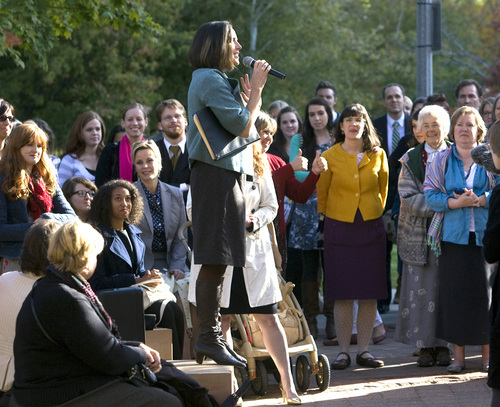 LDS Church spokeswoman Ruth Todd met the women as they walked onto Temple Square from nearby City Creek Park and embraced some of them. She told them what they already knew: that the women&apos;s session, the Relief Society meeting, was last week and Saturday&apos;s night session was for boys and men only. Later, Todd made her way down the line of women waiting to ask for a ticket, conversing with them several dozen men who waited with them. 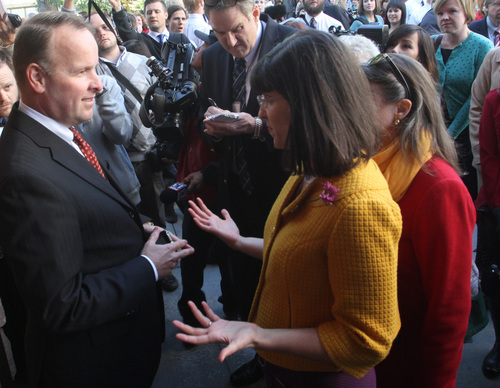 In a statement to reporters, Todd noted that millions of Mormon women do not share the views of those who want ordination. "Most church members would see such efforts as divisive," Todd said. "Even so, these are our sisters and we want them among us, and hope they will find the peace and joy we all seek in the gospel." At least one poll bolsters Todd&apos;s point. Authors Robert Putnam and David Campbell, in their 2010 book, "American Grace: How Religion Divides and Unites Us," found that 90 percent of LDS women opposed female ordination in their church. Ironically, only 52 percent of Mormon men were against it. Even Mormon feminists are divided on the issue. The blog Feminist Mormon Housewives has hosted several online discussions about women&apos;s ordination and the comments ranged from strongly in favor to unsure and opposed. Neylan McBaine, in an essay titled "A Moderate Mormon Manifesto" posted this week on that blog, said she is eager for more gender parity in LDS Church practices, but does not see ordination as the end goal. 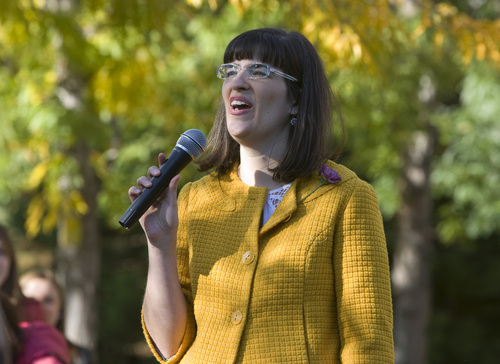 McBaine, founder of The Mormon Women Project, which showcases strong LDS women, wrote that she can imagine a future in which "the general Relief Society president is administratively and ministerially responsible for half of the world&apos;s population in a joint venture of administering the church with the prophet." Mormons heard a more traditional talk about womanhood from apostle D. Todd Christofferson at General Conference earlier Saturday. He chastised feminists who might minimize the importance of homemaking. "Whatever else a woman may accomplish," Christofferson said, "her moral influence is no more optimally employed than [in the home]." Alexandra Sandvik, 24, a law student at church-owned Brigham Young University, said she believes it&apos;s a matter of time before women are given the priesthood. "We expanded the priesthood to African-Americans and now every male can have it," said Sandvik, whose husband, Jason, joined her. "Even if it doesn&apos;t [extend to women], I&apos;ll die a faithful Latter-day Saint." Among those leading the group to Temple Square was Nadine Hansen, who wrote a 1982 article in Dialogue: A Journal of Mormon Thought about women and the LDS priesthood. "I&apos;ve been wanting to have this conversation for a long time," said Hansen, a lifelong Mormon. 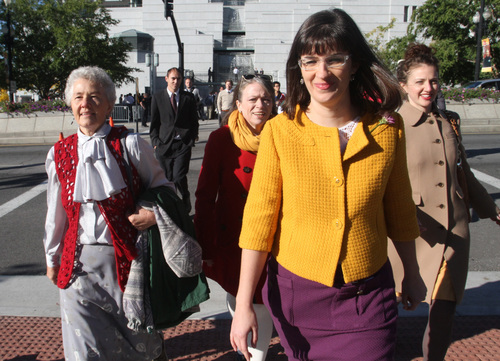 Ordain Women has asked LDS leaders to pray for God&apos;s approval to open the priesthood. But Debra Jensen, one of the organizers, said it&apos;s doubtful those advocating for women&apos;s ordination will stop if the answer is "no." She likened the moment to 1978, when then-church President Spencer W. Kimball reported a revelation opening the Mormon priesthood to black males. "Pre-1978, the answer was no, no, no," Jensen said. "And then the answer was yes." Peggy Fletcher Stack contributed to this story.